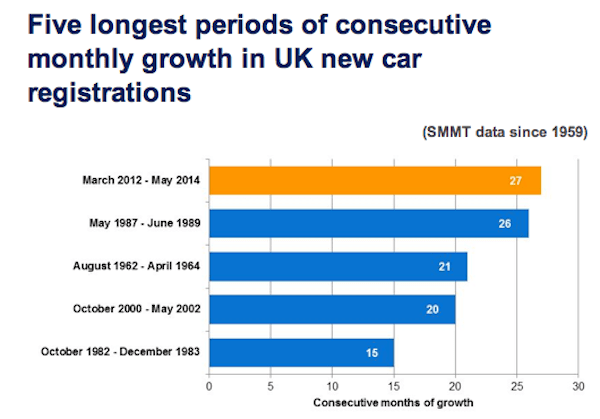 New car sales in the UK are up a beautiful 8% year-on-year in May to 194,032 registrations, bringing the year-to-date total to 1,058,974 units, up an amazing 12% on 2013. This marks the 27th consecutive month of year-on-year gain for the UK market – a new record since sales data capture started in 1959! 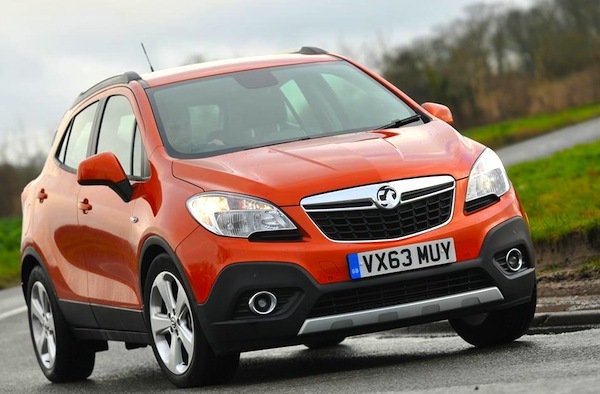 The previous record was 25 years old (May 1987-June 1989)… Rare big event this month: a new nameplate breaks into the Top 10 for the very firs time: the Vauxhall Mokka ranks 10th with 2,801 sales and 1.4%. The last time a new nameplate broke into the UK Top 10 was in January 2013 with the Nissan Juke, and before that in September 2012 with the Peugeot 208. 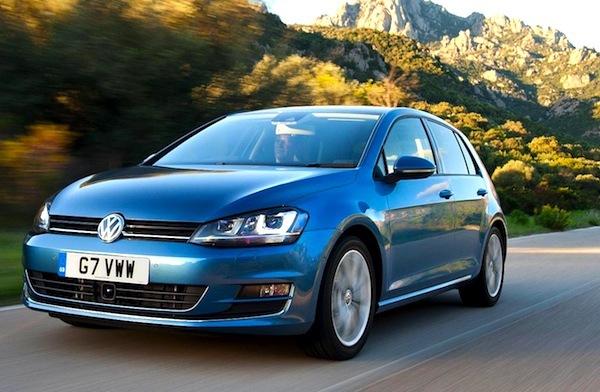 The VW Golf is up 36% to hit its highest ranking in over 3 years. Below the Ford Fiesta regular on top at 9,450 sales and 4.9% share, the second big event of the month in the UK is the 2nd place of the VW Golf at 7,134 units and 3.7%, up a whopping 36% year-on-year and reaching its best ranking in the country since February 2011 when it amazingly topped the overall sales charts. The Vauxhall Corsa is up one spot on last month to #3 while the Ford Focus is down two to #4 as is the Audi A3 to #7 (but up 27% on May 2013). Is the MG revival finally here? 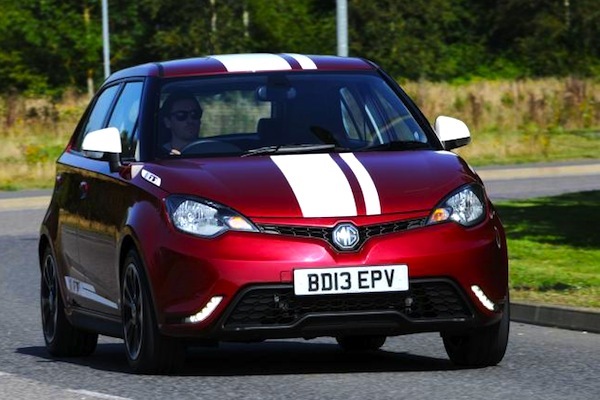 UK MG sales are up 1754% year-on-year in May. Brand-wise, the entire Top 9 best-sellers are identical to April and year-to-date but show varied year-on-year evolutions: Ford is down 9%, Vauxhall up 5%, Volkswagen up a stunning 17%, Audi up 10%, Nissan up 12%, and Mercedes and Toyota both up an even more impressive 21%. Further down, Skoda gains 16% to rank 11th like last month vs. #13 year-to-date, Renault is up a huge 51% at #15, Volvo up 35% to #20, Dacia up 92% to #23, Mitsubishi up 57% to #25, Lexus up 36% to #26, Jeep up 231% to #30 and MG up 1754% to #32. Reversely, Chrysler is down 55% and Chevrolet down 93%. Full May 2014 Top 10 models and Top 42 brands Ranking Tables below.